St. Martin's Griffin, 9780312658588, 304pp. London, 1558. Queen Mary is dead, and 25-year old Elizabeth ascends the throne. Summoned to court from exile abroad, Elizabeth's intimate spy, Brendan Prescott, is reunited with the young queen, as well as his beloved Kate, scheming William Cecil, and arch-rival, Robert Dudley. A poison attempt on Elizabeth soon overshadows her coronation, but before Brendan can investigate, Elizabeth summons him in private to dispatch him on a far more confidential mission: to find her favored lady in waiting, Lady Parry, who has disappeared during a visit to her family manor in Yorkshire. Upon his arrival at the desolate sea-side manor where Lady Parry was last seen, he encounters a strange, impoverished family beset by grief, as well as mounting evidence that they hide a secret from him. The mystery surrounding Lady Parry deepens as Brendan begins to realize there is far more going on at the manor than meets the eye, but the closer he gets to the heart of the mystery in Vaughn Hall, the more he learns that in his zeal to uncover the truth, he could be precipitating Elizabeth's destruction. From the intrigue-laden passages of Whitehall to a foreboding Catholic manor and the deadly underworld of London, Brendan must race against time to unravel a vendetta that will strike at the very core of his world—a vendetta that could expose a buried past and betray everything he has fought for, including his loyalty to his queen. 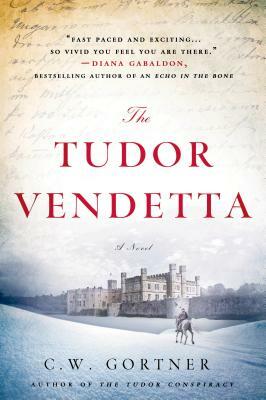 The Tudor Vendetta is the third volume in the Spymaster Chronicles series by C.W. Gortner. C. W. Gortner is the author of the acclaimed historical novels The Last Queen and The Confessions of Catherine de Medici. He holds an MFA in writing with an emphasis on Renaissance studies from the New College of California. In his extensive travels to research his books, he has danced a galliard in a Tudor great hall and experienced life in a Spanish castle. He is also a dedicated advocate for animal rights and environmental issues. Half Spanish by birth, he lives in Northern California.